There is no denying the fact that microcredit (MC) has been playing an important role in the movement for poverty alleviation. But by the same breath it is also a hard fact that it has serious limitations in terms of its delivery system, rules of repayment, interest rate charges, etc. These limitations made it largely fail to realize its potential and expected goals. A credible study on the productivity of MC was required to determine its actual interest paying capability. In the absence of any established economic justification, based on productivity, this exorbitantly high interest rate is found morally untenable and has become the primary target of criticism for its minimal or marginal achievements. As a result, recently the government rightfully fixed 27% as the maximum interest rate chargeable for microcredit (with effect from July 2011). However, we need not undermine the importance and efforts of the microcredit movement, both as an economic as well as a social institution, for the betterment of the poor in the society. We need not be selfish and miser to give the movement its due credit. MC should not be summarily viewed as unuseful and unsuccessful. It has been making some contributions to the betterment of the poor and it should be given the appreciation it deserves. But like many other researchers we are troubled by the contradicting attitudes of the microcredit providers toward the borrowers. In one hand they are concerned and committed to pull the poor out of poverty, on the other hand they are so harsh in the timely payment of repayment installments putting a blind eye to the sufferings of these poor borrowers. Therefore, MCs need to be more innovative to be able to serve and take care of the wellbeing of the critical group among the borrowers. We are also puzzled to see that in spite of the exorbitantly high interest rate charges and all other limitations, increasing number of these poor are borrowing credit from these MCIs. This surgical study on the inside story of microcredit in Bangladesh, using a rich data set developed through a survey of 555 sample borrowers from rural, semi-urban, and urban areas of all 7 administrative divisions of Bangladesh, is an effort to address these issues and find answers to these and other issues like its potentiality to become a growth tool in the third sector economy. To our own best assessment this study made three major contributions to MC literature: a) application of economic-profit counting method in economic productivity analysis, b) identification of the critically vulnerable group among the borrowers; and c) the revelation that MC is respected by the borrowers more as a social than economic institution. To them, microcredit has facilitated their social and political empowerments and safeguarded their social status. We are thankful to the sample micro borrowers for their sincere cooperation and responses in the operation of this research. We are equally thankful to the field investigators for their honest and untiring search for information. Lastly we are grateful to Professor Anisuzzaman Chowdhury of University of Western Sydney, Australia, and Senior Economic Affairs Officer, Department of Economic and Social Affairs, United Nations, New York, for writing a thoughtful foreword to this work. Alam, M.M., and Molla, R.I. 2011. 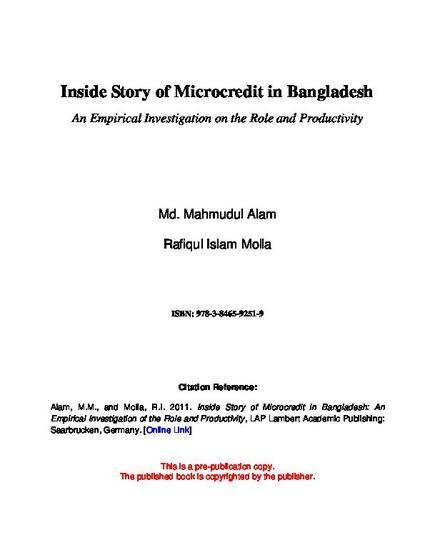 Inside Story of Microcredit in Bangladesh: An Empirical Investigation of the Role and Productivity, LAP Lambert Academic Publishing: Saarbrucken, Germany.